PEER has recently completed an ambitious two phase development project and reopened on 16 April 2016. Phase One was completed in autumn 2015 and has radically improved the public realm area to the front of the gallery. Phase Two began late January 2016 and replaced the two single-glazed shop fronts with a double-glazed façade creating a unified architectural statement that radically reduces heat loss. PEER has also upgraded the gallery facilities to provide a better space for artists, audiences and the local community. These works come at a time when many high streets suffer from homogenisation and the closure of independent traders and smaller businesses as shopping habits have moved online or to mega out-of-town shopping malls. The result of this work will be to integrate the organisation – both physically and psychologically – into the local environment by making the experience of excellent art part of daily life. it is great to see local organisations expanding their remit and increasing their offer to the local community, particularly when developments offer such clear benefits to the local community. PEER has transformed the public realm space extending from the corner of Hoxton and Fanshaw Streets to the front of the Post Office next to PEER. The footprint is modest in size, but strategically positioned at the beginning of a busy local shopping street in an economically and socially diverse part of east London. This unwelcoming and underused space was home to a large and poorly designed raised planter from which the seating was removed because of the anti-social behaviour it attracted at daytime. At night, the space is insufficiently lit and as a result is intimidating and attracts litter and fouling. Over the summer, PEER has turned this space into a more open and inviting place with a bed of planting with shrubs, flowers and climbers. We have planted four Silver Birch trees, installed seating, pavement, bins and bike parking to create a pocket park and community hub. Hoxton Street is home to an historic market (established in 1687), so in addition to re-landscaping and replanting, it is ideally placed to introduce a landmark feature to welcome local residents and visitors. This will take the form of a freestanding pedestal clock, with a rotating illuminated display space below that will act as a community notice board for cultural activities and contemporary art projects. We are currently working with the local tenant management association, a local gardening group from Hoxton Trust, the community police and other local stakeholders to ensure that there is maximum ownership and investment in this project during its development, construction and long-term success. Hoxton Street has been home to PEER since 2002, but the building's original shop fronts are still in use, giving it the look of a temporary or 'pop up' space. PEER will receive a new façade which will exploit the organisation's visibility from the street, maximizing the impact of the outward-facing plate glass window that extends across 10 meters. PEER is working with locally based architects Trevor Horne, who have considerable experience of gallery design, including Victoria Miro gallery and the forthcoming new build Cabinet gallery. Trevor Horne's design simply and elegantly unifies the two shop spaces into one architectural statement. New see-though security shutters will enable projects to be seen outside of gallery hours, and better lighting, flooring and insulation will benefit the work and visitor experience and dramatically reduce heat loss. This will also improve environmental control and enable PEER to exhibit sensitive or delicate works of art, which would not have otherwise been possible. The combined effect of the external regeneration work and the internal refurbishment improvements will make PEER and the local area a better place to visit and work and will greatly help to build new - particularly local - audiences. Furthermore, the newly designed façade and greatly improved gallery spaces will present PEER as a robust and more attractive proposition to potential funders and supporters, which in turn will help ensure the longer-term resilience of the organisation. For further images, plans and information, please see PEER's Development Plans 2015 (pdf, 8.3MB). 16 April - PEER reopens with inaugural exhibition Angela de la Cruz: Hoxton, public art commission Spontaneous City: Hoxton by London Fieldworks and our first annual clock commission by Chris Ofili, Black Hands, 2016, in the new Hoxton Street Public Space . 5 April - Our renovated galleries are now ready and we've started installing the reopening exhibition by Angela de la Cruz today. It's very exciting to be so close to relaunch! Our reopening event is Saturday 16 April 2 to 5pm - all welcome! Come and join in the celebrations! As well as our opening exhibition Angela de la Cruz: Hoxton we also present new public art commissions by Chris Ofili and London Fieldworks and host a performance by The Rude Mechanicals as part of the Shakespeare in Shoreditch Festival. 15 March – We're delighted to have raised £45.5k in today's Contemporary Curated auction at Sotheby's - this will enable us to complete our major gallery improvements and relaunch the gallery in April. We would like to thank all the artists who supported us by donating work: Phyllida Barlow, Martin Creed, Hannah Collins, Keith Coventry, Angela de la Cruz, Tracey Emin, Anya Gallaccio, Joy Gerrard, Antony Gormley, Callum Innes, Elizabeth Magill, Chris Ofili, Cornelia Parker, Grayson Perry, Gavin Turk and Mark Wallinger, everyone who has contributed to the auction and Julie Noble and the Sotheby's team for their hard work and support. We also appreciate support from Lock & Davies conservation and museum framing. 10 March – Great piece about our recently announced spring relaunch plans by Louisa Buck in The Art Newspaper - you can read the online article here. 1 March – Fantastic article by Colin Gleadell in The Telegraph about PEER and our Sotheby's Auction. You can read the online version here or view the article in print. 24 February – To raise the final funds for our major gallery improvements, 17 artists have generously donated work for an auction at Sotheby's on 15th March at 10.30am. Our lots are 32 to 48 in the Contemporary Curated sale - you can register online to bid! A big thank you to the artists: Phyllida Barlow, Martin Creed, Hannah Collins, Keith Coventry, Angela de la Cruz, Tracey Emin, Anya Gallaccio, Joy Gerrard, Antony Gormley, Callum Innes, Elizabeth Magill, Chris Ofili, Cornelia Parker, Grayson Perry, Gavin Turk and Mark Wallinger and to everyone who has contributed to the auction. 5 February – Phase Two works have begun! We have contracted Blou to carry this out, with Graham Martin as our Foreman and his team. 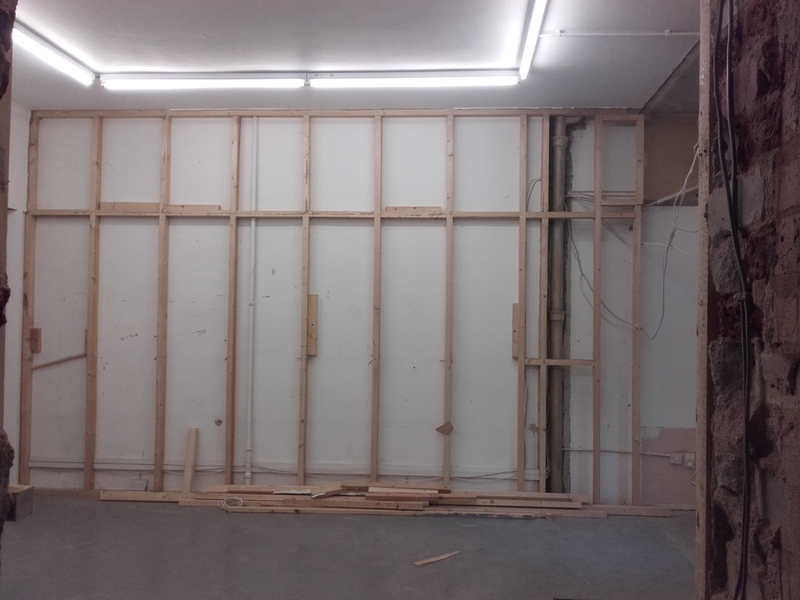 The hoardings are up and the gallery has been stripped, ready for the new improvements. 4 January – Back and refreshed from the festive season. We're ready and raring to get started with our Phase Two developments. A slideshow of the Phase One journey over the Summer. 2 November – We're currently in talks with architects who are drawing up detailed designs for Phase 2, which is due to begin in the new year. 22 October – A colourful variety of bulbs, including daffodils and alliums, have been planted in preparation for our spring programme relaunch. 24 September – Successfully reached our goal of £44K on the Spacehive Campaign with 191 pledges, including the pledge of £19K from the Mayor of London's High Street Fund. This will go towards the instalment of new double-glazed frontage and internal see-through shutters. 19 September 2015 – Community celebration event of the new Pocket Park and improved public space for all the supporters and local residents. 3 September 2015 – We now have four beautiful Silver Birch trees planted outside the gallery. Next week our local volunteers will be planting with garden designer, Yvonne Say. 27 August 2015 – preparation is taking place for the tree pits that will support four new Silver Birch trees and tomorrow we are expecting the steel fencing for our climbing wall of plants. 22 August 2015 – We held our Grand Tombola at Hoxton Street Market to raise funds and awareness within the local community. With the great donations from Hoxton businesses and organisations, we raised £477! 12 August 2015 – the beautiful granite paving arrived this week and is being laid by the building team. Work is also underway on constructing the planted wall with a soil delivery on its way! July 2015 – We're making progress! The large tree stump outside the gallery has been removed after the delicate work needed to avoid the electrical lines that were entwined with the roots. July 2015 – Phase One works have begun. The re-landscaping works provided by Blakedown Landscapes are currently taking place. Once completed, the next step will be to welcome the Hoxton Trust Horticultural group and volunteers to work with Community Garden designer, Yvonne Say, to take part in the re-planting of new space. PEER is currently engaged in fundraising for the remaining match funds necessary to complete Phase Two. This will be achieved through a combination of trusts and foundations, individual donations and a crowdfunding scheme in the autumn. The capital improvements of this phase will unify the two shop fronts into one architectural statement with a new, 10-metre double glaze façade onto the high street. Insulation and efficient radiant heating will enable PEER to have effective climate control and dramatically reduce its carbon footprint. Other improvements will include new gallery lighting and flooring and upgrading the facilities and storage for the participation space, office and archives. Phase One works have achieved the necessary match funding from the Mayor of London’s Pocket Parks scheme and with historical ring-fenced funding from Deutsche Bank. This phase will see the radical transformation of a poorly designed and underused public realm space into a welcoming green space, including the introduction of lighting, seating and a new, distinctive landmark feature. Strategically located at the beginning of Hoxton’s busy high street, these works will improve PEER’s visibility and accessibility, and create a friendly environment for the local community and visitors to the gallery. PEER has appointed locally-based Trevor Horne Architects to carry out the design, a practice with considerable experience of contemporary art galleries, including Victoria Miro and the new build Cabinet gallery opening later this year. This grant also secures the renewal of a seven-year lease with landlords, Hackney Council, on a discounted Voluntary and Community Sector rate. PEER is delighted to announce that it has been awarded a Small Scale Capital grant of £140,000 by Arts Council England that will cover approximately 50% of the costs of carrying out significant improvements and upgrades to the façade, gallery, participation and office spaces and also to the public realm area to the front. These works will be undertaken in two phases, beginning with the exterior works in June and July, followed by the works to the building in the autumn, which together will radically improve PEER’s provision to artists, audiences and the local community. PEER has been based in Shoreditch since 1999 and moved to 99 Hoxton Street in 2002. The organisation expanded into the adjoining unit in 2010, which more than doubled the gallery footprint and created a participation space for outreach and community activities. This visibility from and relationship to the street is at the core of PEER’s ethos of creating a gallery in the expanded field, which offers engagement with high quality art as part of everyday experience. These gallery and public realm improvements will greatly enhance these ambitions, and will help to ensure PEER’s resilience and sustainability for the future.